Have you checked out Lonely Planet’s list of must-visit destinations in 2019? It is no surprise to us that Indonesia is on the list. Indonesia is an incredibly diverse country with hundreds of gorgeous islands, each with a completely unique culture. Most visitors to Indonesia make their way to Bali, but there is so much more to “Indo” than just Bali (although we do love Bali too!). We are always trying to get off the beaten path when we travel and in traveller circles the island of Flores is becoming the next big thing. Flores is located in Nusa Tenggara, east of Bali and is best known for Komodo National Park. Originally we had planned to just do a boat trip through Komodo, ending up on Lombok. But after a little research, I knew we needed to spend some time on the mainland exploring the volcanoes, traditional villages, mountains and beaches. Each of the islands of Indonesia are very diverse, with varying cultures and religions. The island of Flores is predominantly Catholic, quite the contrast from Hindu Bali and the majority Muslim population of Indonesia. Easily accessible from Bali, the island is gaining attention for its pristine wilderness and rich culture that can be explored along the 671 km trans-Flores highway. Flores was colonized by the Portuguese, thus explaining most islanders conversion to Catholicism. However, Christianity meshed with animistic traditional practices creating many unique cultures throughout the island. In the volcanic hill areas, you can encounter villages that have had little contact with the outside world. The island is part of Indonesia’s volcano belt and possesses 17 volcanoes. In an island only 400 km long, that is pretty spectacular! While sadly we saw lots of plastic pollution on the beaches of Flores, the island is known for its underwater marine life and diving. Flores is one of the poorest islands in Indonesia, lacking any natural resources. The local people are very appreciative of tourists coming to their island and are extremely welcoming. Getting around the island is very slow going and tourist infrastructure in its infancy. But, if you are looking for a truly off-the-beaten-path destination, you will love this island. 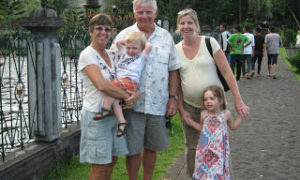 As soon as we arrived in the Maumere airport, we knew we were in a very different destination from Bali. No tourist shops, touts or billboards greeted us as we walked from the airport to the tiny airport building. 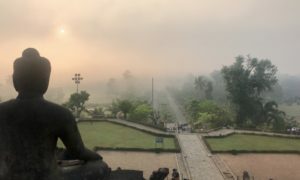 The lush green of Bali had been replaced by low-lying brown scrub and the Hindu temples replaced by Catholic churches. We were surprised to find a man holding a sign with our names on it, who turned out to be the driver, Mesak, that we had hired starting the next day to take us across the island. I am not sure if he showed up just to welcome us or to collect the deposit, but nevertheless, it was a nice surprise. Maumere is on the east side of Flores and was known for its pristine diving before most of the reefs were destroyed in a 1992 tsunami that killed 900 people in the city. The reefs are slowly rebuilding themselves and tourism is just starting to return. We had heard about a wonderful eco-guesthouse called Pantai Paris, run by the lovely Susi, which turned out to be a great choice. Susi’s simple guesthouse runs more like a social enterprise where she takes on environmental projects and employs disabled workers. Located directly on the water, we enjoyed walking the beach and taking in local life – fisherman coming in and kids playing soccer on the beach. On either side of Pantai Paris, there are two simple restaurants where you will likely be the only diners. We were greeted our first night with the most gorgeous sunset and felt really good that we had picked this gem of an island. In the morning Mesak, our driver, was back to start our trip across the trans-Flores highway. Our first stop of the day was Wuring Sea Gypsy village, just outside of Maumere. The people of this area are descendants from the Bajo indigenious group, nomadic boat dwelling people that have settled in coastal communities as the sea alone cannot support them anymore. They have built their homes on stilts over the ocean and live simply. Although the community was preparing for a celebration when we were there, they were just as excited as we were to meet us. The kids especially attracted a lot of attention and they were very welcoming as we walked around the village. As we drove through the countryside, it was fascinating to see the local homes. What was interesting for us to see was that each house had cement graves out front of it where they buried their ancestors. We saw children playing on these graves and women preparing food on them. The next stop was the small village of Sikka, one of the Portuguese’s first settlements on Flores. It was Sikka’s gorgeous open air cathedral that drew us there, where you could hear the waves crashing from inside. Our car was swarmed immediately by the friendly, but persistent ladies selling ikat, the famous textiles of the island. I loved the natural indigo dyed ikat and brought home a lovely piece from an elderly lady (Ikat scarves were 200-300K IDR). 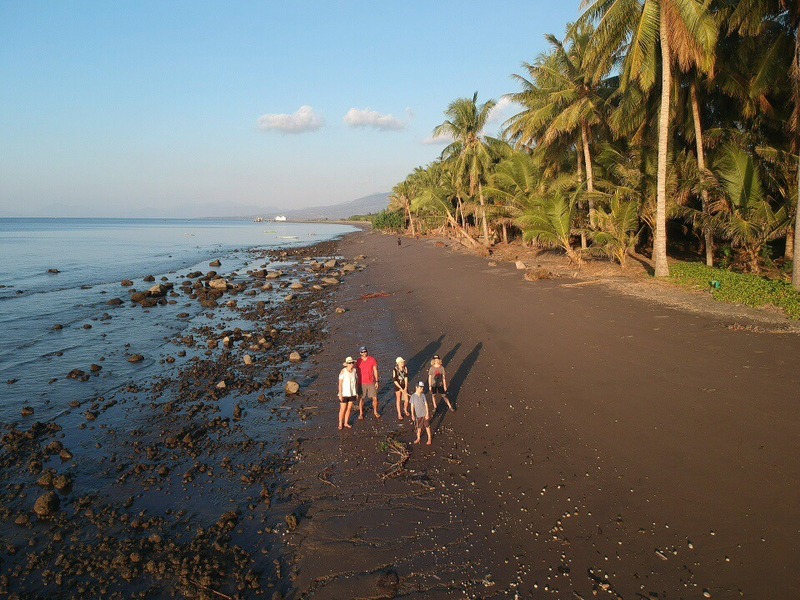 This beach is rumoured to be the next big thing of Flores and it wasn’t hard to see why. After a bumpy ride down a small road through a cocoa plantation, we emerged to two gorgeous swooping bays. There is a small restaurant where we had some fresh fish (50k IDR/person) and spent some time enjoying the warm waters and sand. It costs 10k IDR to use the road and 20K IDR to park a vehicle. You can also walk to a lookout between the bays for 5k IDR. Our stop for the night was the picturesque village of Moni, set upcountry in the rice fields. This is the gateway for visits to Kelimutu National Park, one of the major sights on Flores. From Kelimutu’s rim you can view the three deep volcanic lakes, each in a magnificent colour, especially at sunrise. 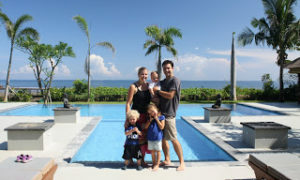 Accommodation gets booked up quickly in Moni in peak season and we felt very happy to have scored a family room at Bintang Lodge, even if it was a bit expensive (770k IDR). It was much cooler at the higher elevation and we added on our layers as we looked out over the rainy and cloud filled valley. Unfortunately it rained all night and we slowly realized that we would not be visiting Kelimutu the next day. The road into the National Park is very steep and not in great condition and our driver and the lodge owner recommended we not attempt it. With all the rain and clouds, we wouldn’t be able to see anything anyway. This was one of the things we were most excited about visiting on Flores and it was devastating to have to move on without seeing it. I would definitely recommend giving yourself 2 nights in Moni, in case you have poor weather like we did. This would also allow you to walk down the mountain, through the village and rice fields. On day 3, we headed down the mountains to the coast and the large city of Ende. Ende is a port city with a large Muslim population on the otherwise Catholic island. We didn’t stop to linger, but did stop at the famous Blue Stone Beach just west of Ende. This beach is well known for its blue stones that make for a gorgeous sight against the black sand. Unfortunately a lot of the stones are being collected for export as landscaping stones. We had an okay lunch at a small restaurant at the beach. From the coast we headed inland into the mountains again for our next stop, Bajawa. Along the way we saw fields of cassava, banana and papaya and cloves and cocoa laid out in front of houses to dry. The terrain alternated between lush green forest and dry, arid land. The volcanoes with their classic shapes were an exotic sight and we sometimes even saw smoke coming out from the cone. Flores is full of hot springs or “air panas” due to its 14 volcanoes. Our driver took us to Mengaruda Hot Springs on our way to Bajawa and while it wasn’t our favourite hot springs on the island, it was nice. The cost was a very reasonable 14k IDR/adult, 7k IDR/child. There were lots of locals enjoying the very hot waters and the park was clean and well maintained with a small playground and picnic area. The only thing the wasn’t so desirable was the very simple toilet facilities. The kids had a blast enjoying the natural slide in the river and finding tiny pool to soak in. Bajawa is the commercial centre for the Ngada people that live in the surrounding hills. The 60,000 Ngada people practice a mix of Christianity and animist and are known for their traditional thatched roof houses with stone monuments decorated with buffalo horns and jawbones, a sign of wealth. The countryside is lush and gorgeous and the villages are incredible interesting. We stayed in Bajawa two nights so we would have a full day to explore the countryside and villages. Since it is at elevation, it was chilly in the evenings. The actual town of Bajawa was nothing that interesting. We stayed at the Edelweiss Homestay, which was much more of a homestay than we were expecting and wouldn’t really recommend it (250k IDR/room, we had 2). We had good meals at Lucas Café, although it was smelly as they cook with kerosene and the kitchen is not well ventilated. The soup and warm drinks were great for the chilly nights. Our driver had organized for us to hire a guide for a visit to the villages. The cost was 25-35k IDR and it was well worth it to have a local explain what we were seeing. We visited three villages: Luba, Bena and Tolo Lela. While there were a few other tourists walking around, the villages did not feel crowded or exploited. It was strange that there didn’t seem to be many local people around. In most villages you pay a small donation and in Bena, the amount is set at 25k/adults, 5k/kids. As more and more people are becoming interested in visiting these villages, the locals will have to balance maintaining their traditional ways with modernization and visitor’s curiosity. The unique shape of the roof allows the homes to stay cool in the day and warm in the night. The front porch is used for weaving, then the kitchen and at the back the sleeping areas. After visiting Luba and Bena, we made our way on foot for an hour through the mountains to Tolo Lela. As we walked, we saw smoking volcanoes and occasionally people working the jungle. This hot springs was our favourite because it wasn’t really commercialized. After a very simple meal cooked in a very rudimentary kitchen at the hot springs (noodles, rice, veg for 20k/person), we loved soaking in the confluence of the stream at the base of the volcano combining super hot water with cool water. There were lots of local families and our kids were a big hit. There is a wooden shack to change in. On day 4 we flew from Bajawa to Labuan Bajo. The distance is only 265 km, but the road is very slow going. If we had longer in Flores, we definitely could have spent a few more days getting our way to Labuan Bajo by car. There are quite a few interesting stops like the traditional village of War Rebo that you need to hike to, the spiderweb rice fields of Ruteng and the limestone cave at Liang Bua where the Flores ‘hobbit’ was discovered. We flew on a tiny Wings Airline propeller plane to Labuan Bajo. Flights cost $40 CAD/person, which is well worth saving the cost of saving a full day of traveling overland. We got a kick out of the fact that the floor of the airport was dirt. We have been to lots of small airports, but this one had to have taken the cake. Once we landed in Labuan Bajo, we walked to our hostel from the airport – a first for us! This dusty town is going through a rapid transformation as it becomes the hub for the increasing visitors coming to Komodo. The town has gorgeous views overlooking the islands of Komodo National Park and more tourist amenities. While we appreciated the wide choice of accommodation and food, we missed the quieter feel of the rest of the island. When we arrived in Labuan Bajo, our goal was to quickly book a boat that would take us to Lombok. We cruised the main street stopping at all of the travel agencies and decided on a Hartini Adventures boat that would leave the next day. Hartini seems to no longer exist, but most companies offer a similar itinerary and price. We treated ourselves to an afternoon of cocktails, dinner and swimming at the roof top pool at Le Pirate, a cute bar/restaurant in town. While in Labuan Bajo, we stayed at Dorme Tree, a new hostel where we rented out our own room with 3 sets of bunkbeds. It was slightly out of town, but clean and the restaurant served good food. We even walked to the hostel from the airport! There are so many options for Komodo National Park trips, from luxury to backpacker style. Quality does vary and there have been safety issues in the past. The trip we chose was a 4 day/3 night trip that took us to Lombok. Many visitors fly into Labuan Bajo and will go on a multi-day trip, returning to Labuan Bajo. You can read all about our trip on our Komodo blog post. The trans-Flores highway runs east to west across the island. The road is in good condition, but don’t expect to travel quickly. There are bemos (mini buses) that ply the trans-Flores for the most budget conscious travellers. We opted for a bit more comfort and hired a car and driver for 3 days to take us between Maumere to Bajawa. It was a great choice for us as it allowed us to dictate our schedule and stops. Our driver also acted as a guide and taught us a lot about the island and its culture. If you are looking for a nice and safe driver, we can definitely recommend Mesak Tefbana. You can reach him at tmesak@yahoo.co.id . We had very comfortable 7-seater Innova, giving us plenty of room. We found that there wasn’t a lot of choice for accommodation outside of Labuan Bajo. Due to its more remote location, accommodation was more expensive than Bali, and not as nice. It was more difficult to find family sized rooms, especially since we were travelling in summer, peak season. Food choices were very limited on the island of Flores. The island is one of the poorest in Indonesia and the foods reflect that. Staples foods include rice, tempeh, fried bananas, vegetables, tofu and occasionally fish and chicken. When the kids did order chicken, it was often a very tiny, boney piece. The exception to this was Labuan Bajo where you can get cold-pressed juices, tacos, gourmet ice cream and more. We found the island to be very safe and felt very comfortable traveling. Since it is a developing country you do want to take the standard precautions about food and water. Since tourism is only starting to gain traction, it is refreshingly hassle free. There is a malaria risk on Flores and we did take malaria prophylaxis in this region of Indonesia. The island of Flores has airports in Maumere, Ende, Bajawa and Labuan Bajo, with connections to major cities in Indonesia. The most convenient way for most visitors to get to Flores is through Bali – Denpasar. We flew to Maumere with Garuda on a small plane and it really was like arriving in an entirely different country. Labuan Bajo, the largest airport on the island has recently been rebuilt and is the entry point for visitors visiting Komodo. You can also take the backpacker boats that ply the waters between Lombok/Gili Islands and Labuan Bajo. We did this to get to the Gili Islands and it was definitely a unique experience. You can read our full post on our Komodo boat trip here. Flores has so much to capture the interest of kids – volcanoes, beaches, colourful lakes, hot springs, rich traditional villages. Tourism infrastructure is very basic outside of Labuan Bajo with limited accommodation and food choices. Getting around is extremely slow going; don’t underestimate the distances. If you are short on time like we were, consider driving part of the trans-Flores highway and then flying across the rest. If you are comfortable travelling in developing countries, off-the-beaten-path, Flores makes a great adventure destination for families. Save this for later. PIN to Pinterest!